The 3D Real View is one of the most powerful tools in 3D. Within the Real View, you are able to visualize your drills with fluid marching animations and true 3D performers. Customize the performer’s uniforms and instrumentation to see your work in a performance scenario. Detailed below are the features and options you’ll find in the Real View window. The slider on the bottom left side of the Real View window adjusts the zoom of the Real View. Move the slider left to zoom in, and right to zoom out. Zoom can also be adjusted by scrolling your mouse wheel while the mouse is inside the Real View window. You can either click the Left-Right arrows, or drag the handle to adjust the field of vision horizontally. Horizontal view can also be adjusted by holding down a right-click and moving your mouse left or right. This button will reset the default location of the Real View camera. If you have multiple cameras (for example, Blimp and Sky cams) enabled in the Real View, you can toggle the focus of the main camera by pressing the Swap Cameras button. Pressing the Swap Cameras button multiple times will cycle through the cameras. Cameras in the Real View have multiple options, from multiple angles, viewpoints, and panning. To adjust any of these settings, select the Cameras button in the Real View window. This will open a control panel with two tabs. Sky Camera Movement and Active Cameras. The Sky Camera Movement tab is where you will find options for camera panning, as well as setting values for fixed camera angles. Camera Angles: There are 6 camera radio buttons available for you to quickly jump to different viewing angles when watching the animation or previewing a chart. To set specific angles to a preset button, change the view point in the Real View window to your desired angle, then press the Cameras button. Select the Sky Camera Movement tab. Assign the angle you created to a radio button, 1-6. Once you save a camera angle through this process, you amy instantly jump to that view in the Real View anytime during the design or previewing animation process. To remove all saved camera angles, press the Cameras button, then choose Clear on the Sky Camera Movement tab. Camera Panning: Camera panning is based on the placement of your Red Anchor on the Count Track. Once the anchor is in the desired starting position, adjust the Real View field of vision, then press the Cameras button. This will open the Real View Cameras window. 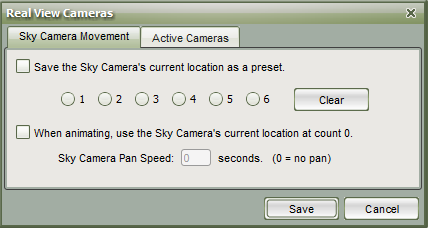 On the Sky Camera Movement tab, select the check box to use Camera panning starting at count X (where X=current Red Anchor location). The Camera Pan Speed sets the speed of the camera pan. Leaving the speed at 0 will result in a snap, or no pan, to the set camera location. After the preset Camera Angle Speed has been set, press Save to retain the Camera Angle information. The 3D Real View allows up to 4 different active cameras at once. To set your active cameras, select the Cameras button on the Real View. The Sky Camera is the least restricted of the 4. It can zoom as far in or out as desired, and be set from any view point. 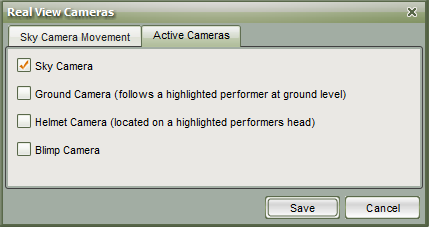 The Ground Camera will follow a performer that has been selected with the Spotlight tool. This camera can be set to any angle, however the zoom is restricted. The Helmet camera is a first person view of a performer that has been selected with the Spotlight tool. This is a fixed view point dependent on the selected performer’s facing. The Blimp Camera is an aerial view with limited zoom. Any tilting or sliding in this view has been disabled. The Document Options button on the Real View window is a way to quickly launch to the Real View Perspective tab in a drills’ Document Options. Here you can specify settings for fabrics (such as uniforms and flag silks), default visuals, and a performance surface (if any). If camera panning has been assigned to a drill file and you wish to ignore it, select the Show/Hide Camera Panning button. This will keep the Real View window at a fixed angle while playing the animation. 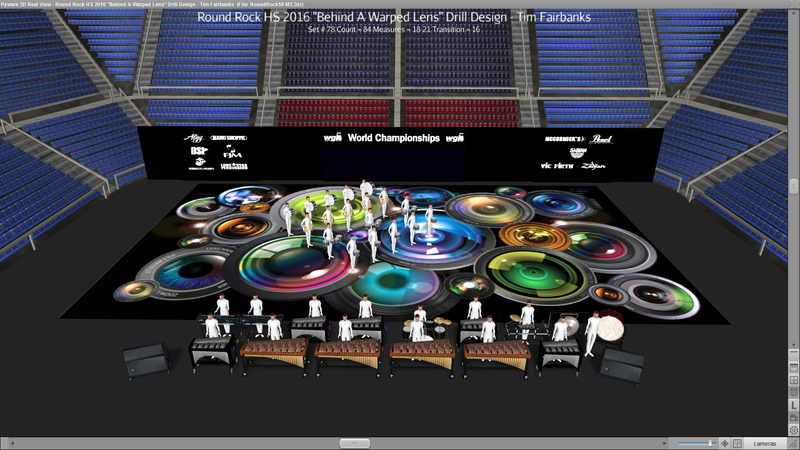 Performer labels can be displayed in the Real View window. This is particularly helpful when using the Ground or Helmet camera options, so the selected performer has a better understanding of their responsibility and immediate surroundings. By default, performer labels are displayed in the Real View. To hide performer labels, press the Show/Hide Labels button in the Real View window. If labels have not been assigned to performers, 3D will display labels automatically assigned based on the order that performers were entered. These labels will be replaced by user entered labels through either the Performer Labeling tool or the Cast List. In the Real View window, you have the option to display step grids and performance surfaces. To do so, select the Show/Hide Performance Surface button in the Real View window. Clicking the button switches the option between the step grid and any existing performance surfaces loaded into the drill. You can either click the Top-Bottom arrows, or drag the handle to adjust the field depth. Depth can also be adjusted by holding down a right-click and moving your mouse up or down (while inside the Real View window). 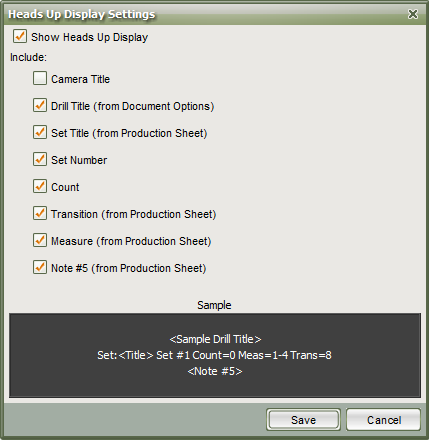 Production Sheet data can be displayed as an overlay in the Real View window. This information shown can be adjusted by clicking on the HUD Settings button located on the Real View window. In the Real View window, click the HUD Settings button. A new window will appear. To enable the HUD, check the Show Heads Up Display option. You can also choose to include or exclude any of the data listed in this window for display in the Real View. When your options are set, press Save. When selected, the Window Shade option will open the Real View perspective while animating, and keep the window shaded when not animating. This feature is especially helpful if you are running 3D on one screen.